WASHINGTON (AP) — Kamala Harris had the best campaign roll-out. Amy Klobuchar’s snowy debut showed grit. Elizabeth Warren’s opening campaign video was a bit odd. Take it from an unlikely armchair pundit sizing up the 2020 Democratic field: President Donald Trump. 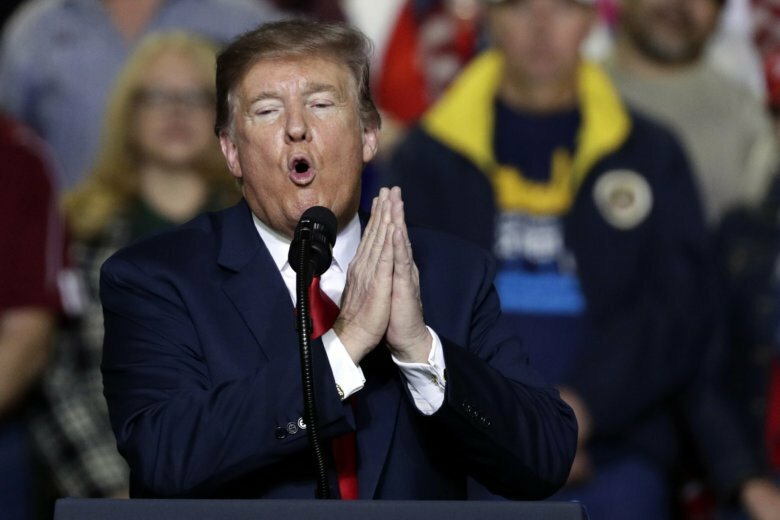 In tweets, public remarks and private conversations, Trump is making clear he is closely following the campaign to challenge him on the ballot. Facing no serious primary opponent of his own — at least so far — Trump is establishing himself as an in-their-face observer of the Democratic Party’s nominating process — and no one will be surprised to find that he’s not being coy about weighing in. Presidents traditionally ignore their potential opponents as long as possible to maintain their status as an incumbent floating above the contenders who are auditioning for a job they already inhabit. Not Trump. He’s eager to shape the debate, sow discord and help position himself for the general election. It’s just one more norm to shatter, and a risky bet that his acerbic politics will work to his advantage once again. But often Trump’s commentary reflects a peculiar sense of disengagement from the events of the day, as though he were a panelist on the cable news shows he records and watches, rather than their prime subject of discussion. He puts the armchair in armchair punditry. “Personally, I think he missed his time,” Trump said Tuesday, hours after Vermont Sen. Bernie Sanders’ launched his second bid for the White House. In an interview with The New York Times last month, Trump assessed Harris’ campaign like a talk show regular, declaring her opening moves as having a “better crowd, better enthusiasm” than the other Democrats. Crowd size was also at play last week when he held a rally in El Paso, Texas, that was countered a few blocks away by one led by former Rep. Beto O’Rourke, a potential 2020 candidate. Inside the West Wing and in conversations with outside allies, Trump has been workshopping other attempts to imprint his new adversaries with lasting labels, according to two people on whom the president has tested out the nicknames. They spoke on condition of anonymity to discuss private conversations with the president. He is also testing out lines of attack in public rallies, exploring vulnerabilities he could use against them should they advance to the general election. No candidate has drawn more commentary and criticism from Trump than Sen. Warren, the liberal Massachusetts Democrat. Warren’s past claims of Native American heritage prompted Trump to brand her “Pocahontas” and he has shown no qualms about deploying racially charged barbs harking back to some of the nation’s darkest abuses. “If Elizabeth Warren, often referred to by me as Pocahontas, did this commercial from Bighorn or Wounded Knee instead of her kitchen, with her husband dressed in full Indian garb, it would have been a smash!” Trump tweeted. Even in the midst of the partial government shutdown, those tweets mocking Warren were widely joked about by White House staff weary from the protracted closure, according to one aide who spoke on condition of anonymity to discuss internal conversations. The person said the president repeatedly ridiculed Warren’s video in private conversations with aides and outside advisers. Attention from Trump can drive up fundraising and elevate a candidate above a crowded field. But responding to attacks also distracts from a candidate’s message. Trump’s rivals in the 2016 GOP primary learned that lesson as he bedeviled them with name-calling. Trump goaded Sen. Marco Rubio of Florida into making a thinly veiled insult of his manhood that quickly backfired, and weeks later he sucked Texas Sen. Ted Cruz into a brutal back-and-forth about an insult he had leveled at Cruz’s wife.